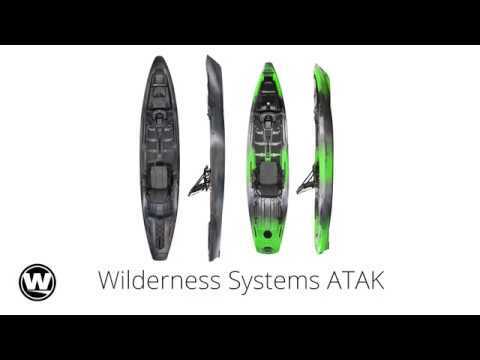 The Wilderness Systems ATAK 120 - Advanced Tactical Angling Kayak - is taking the kayak angling world by storm. It features an open design that can be customized to meet the needs of almost any angler. The deck is highly walkable and stable - a feature that was achieved without needing to add more width to the boat, allowing for sustained speed and glide. The deck is low-profile and intentionally designed to shed wind. Storage opportunities are abundant and are thoughtfully located throughout. The exclusive Flex Pod OS system, combined with two additional hatches, provides the 120 ample storage space as well as the option for electronics or Helix MDTM Motor Drive integration. A secondary transducer scupper also has been added to allow more flexibility for electronics, including side-scanning. The ATAK is highly adaptive boat that can fish any environment and target species. Limited number of 2018 closeout colors available, price applies only to stock on hand. Fantastic Kayak...Really Love It. I have been out on the water 5 times at Pace Bend. It tracks straight, is super stable, and brings in the bass. I have been slowing adjusting my set up, and am close to having it just perfect. I installed the lock lever anchor trolley and put a 50' rope on the anchor. have a crate in back with 3 rod holders and two railblazer rod holders and a lowrance elite 5ti fishfinder. This is a great Kayak, and I would recommend it and ACK to anyone. I had been fishing out of a Tarpon 120 for three years and wanted something that would allow me to stand. The ATAK 120 did not disappoint. I was standing and fly fishing within the first minute! Very stable with plenty of room for gear. Not as easy to paddle as the Tarpon, but definitely manageable. That is one of the trade-offs for stability. I got in about 18 hours on the water the first weekend and was very pleased with the ATAK's performance. The staff at Austin Kayak certainly steered me in the right direction and they were a joy to work with. 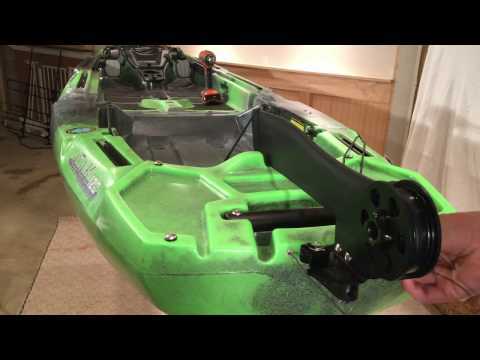 Great fishing kayak! The best I've purchased! Amazing yak. Wasn't able to even attempt to stand on my old ride 115, I was stand up fishing within minutes on the atak. Absolutely worth it. Great storage space, great cockpit space. Only complaints is that it's a bit slow and was a bit unwieldy in heavy wind, but that could be any kayak. Very satisfied overall with purchase. Q: What model year ATAK 120 are you selling? A: They are 2018 models currently! I spoke to Customer Service this morning. Breeann said they are shipping the 2018 models. A: The product weighs 70 pounds without the seat; with the seat and the accessories, the total comes to 86 pounds. Q: What is the weight of the kayak? I've seen it listed as 70 lbs or 86 lbs. A: The weight of the ATAK with the seat is going to be 86 pounds. Please let us know if you have any other questions! Q: Can you put a rudder on the wilderness systems ATAK 120? Q: Can you put a rudder on the wilderness systems ATAK 120.Next does it track well? A: Yes, you are able to put a rudder on the Wilderness Systems ATAK 120. The ATAK 120's has excellent tracking because of its defined keel line as well.